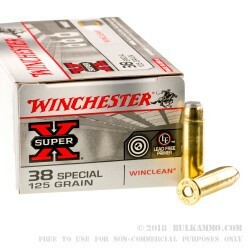 Shoot your revolver more and clean it less with these 125 grain .38 Special Winclean rounds from Winchester! The .38 Special round has been around for over 100 years, and remains a popular cartridge for target shooting and personal defense to this day. So you can get the most time shooting and spend less time cleaning, Winchester developed the Winclean round, which uses a fully enclosed base on the projectile, reducing both lead fouling and lead particulate in the air. 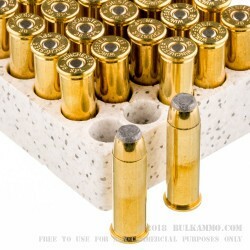 These Winchester .38 Special rounds are loaded to standard pressures for .38 Special, making them safe to use in older revolvers as well as modern manufactured guns. The 125 grain bullet uses a jacketed soft point, so the Winchester rounds could be used on small game in addition to target shooting. Packed in boxes of 50, these .38 Special rounds are soft shooting, less fouling, and reduce airborne lead. They’re the perfect choice for your next range day!